Our cattery have litter of kittens the Cornish Rex from American lines. ....Purebred elite kittens are waiting for their caring owners. these kittens will grow into luxurious noble cats..... We have available. 2 seal point girls with blue eyes .reserved. 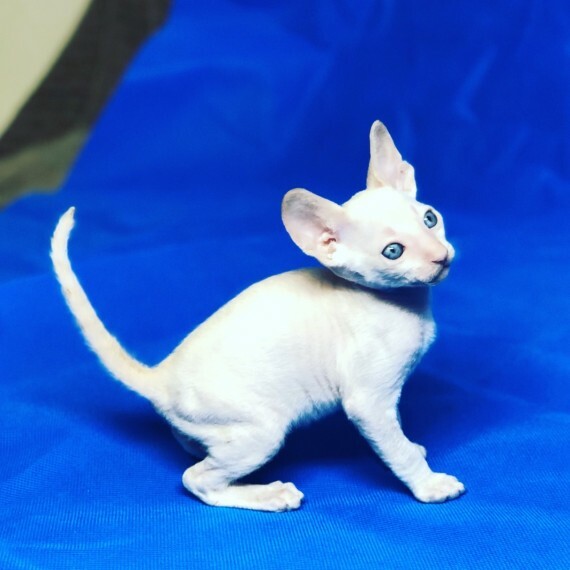 1 seal point boy with blue eyes 750 .reserved. 1 white boy . Red Point. with blue eyes 750 .reserved. 1 white boy .Red Point. with blue eyes 750 .reserved. Dad is Point Grand Champion. mum is Point adorable Dam lots of champion lines. They are sweet and beautiful babies. All our kittens will be .Full Pedigree Register .full course vaccination .wormed . kitten pack . 4 weeks free insurance Ready to leave in December December. just before Christmas .................... 750 each as a pet only. Available for reservation. 200 deposit required .weekly will update you with new photos and videos.. One of the picture from our previous litters. If you are interested in any kitten just contacting me.